Tanna lives in a world that seems not too far off from our own; a time when vampires are no longer myth but present and a threat. These vampires have been contained in our modern world into cities, Coldtowns, guarded but connected by live feeds, blog posts and news stories. Sensationalized and romanticized, but Tanna knows the darker side of the story. She has a sad, frightening tale of infection gone horribly wrong in her family's past. I had the pleasure of meeting Holly Black at the Chicago ALA where she signed my ARC copy of The Coldest Girl in Coldtown. To show our appreciation for all of you lovely readers, I’m going to share my copy with one lucky person! The giveaway is INTERNATIONAL. Just fill out the rafflecopter below. A gorgeous Holly Black with stunning blue hair! I can't wait to read this one especially now after your review! This sounds like a creepy read with great characters (Tana has a similar name to mine) :) I'm so glad you enjoyed it Rachel :) Great review. Anna Dressed in Blood! Loved it. Little Red Riding hood? Hey it's a classic. This book caught my eye months ago, nice review. The Mara Dyer series, it's super creepy and confusing! I'm pleasantly surprised you enjoyed this one, only because I haven't seen too many positive reviews of it floating around. I love Holly Black, though, and even thogh vampires aren't my thing, I think I'll have to give this a try for sure. Great review, Rachel! I wasn't sold on this one until I saw the trailer. The trailer is so cool - have you seen it? I'll definitely be checking this one out now! I haven't read Anna Dressed in Blood which is supposedly very creepy, but my favorite creepy read is Mara Dyer series. (Especially book #2 which made me scared of the dark for at least a week :D LOL) I'm so glad you liked this. The positive feedback for this is mindblowing. Everyone seems to love it. I'm so intirgued by this novel and it seems like a very original story. I'm happy that the romance made your heart beat faster and that the MC was so easy to connect with. That's the footing of a great story. I'm so glad you got to meet Holly. You look pretty darn fine yourself, sweetie ;-) And Holly is awesome! I honestly haven't read anything creepy... partly because I easily get scared so to avoid nightmares I steer clear of anything that creeps me out and gives me the beejebies. But I heard great reviews about Holly Black books so this would be her first book that I'll read and eventhough it's creepy, I definitely would want my first creepy read to be this one. Like the title and the story seems interesting. Going to add it to my list to read. Favourite creepy read? Haven't read many those lately... Anna dressed in blood is on my reading list and I've read Mara Dyer... favourite though? Ever read mangas? Ghost hunt for example? I'm so glad to hear that you enjoyed this, Rachel! I can't wait for it to come out so I can experience its awesomeness as well. The romance sounds so swoon-worthy and I know I'm going to like it! "The thing about a romance that’s not in your face is that you spend time analyzing every move and glance, and every word spoke, until what you suspect and hoped for is confirmed!" Even the plot sounds interesting. It doesn't look like it's the same repetitive vampire book. I haven't read Anna Dressed in Blood which is supposedly very creepy, but my favorite creepy read is Mara Dyer series. I really liked the romance in this one. Sometimes, if a romance is all-consuming, it takes away from the story (unless it actually is a romance novel and that's the point of the story). This was beautifully written and the romance added to the story rather than overwhelming it. Loved! I have this one for review, and I'm so glad to see that it keeps getting solid reviews. Plus, the romance sounds just right...like Mary says, I need a romance that doesn't force the rest of the story to take the backburner, you know? Lovely review, Rachel! Okay, I wasn't sure this book would be one for me but you've absolutely convinced me it is! Thanks so much for the great review! And giveaway! Favorite creepy book... that's a tough one! I love Gretchen McNeil's books. I also like The Unbecoming of Mara Dyer, which was pretty creepy too! I am so anxious to read this one! Though this will be the first book I read by Holly Black! My favorite creepy read up till now is 'Unraveling Isobel' by Eileen Cook and "Anna Dressed in Blood" by Kendare Blake. YES!!!! That's exactly how I feel with the more subtle romances too Rachel - I just read and reread every scene between the couple and try and find any clue that they're headed in the direction I want them to go:) I'm a little nervous about your mention of gore as I am a giant wuss and don't deal well with that kind of thing, but I want to read this one too much to let that stop me:) SO EXCITED! The Odd Thomas series by Dean Koontz. Thanks for sharing and congrats to Holly on the release! I really loved 172 Hours On The Moon. It was creepy and chilling and sometimes more then a little scary. Hmmm... I recently read The Madman's Daughter by Megan Shepherd and thought it was fantastic. Firstly Holly's hair is AWESOME, and secondly thanks for the review and giveaway! I love creepy gothic stories so this sounds like something I'd love! My favorite creepy book? That may be the hardest question anyone has ever asked me. Haha. The last creepy book I read was Doll Bones by Holly Black. I Hunt Killers & The Game were both pretty creepy! Love the sound of dark and mysterious! I couldn't decide whether to get this one or not and now I want to! I love creepy and even though I am burned out on vamps, I can totally do one with the scary kind. This sounds like a thriller! You look pretty darn gorgeous yourself there with Holly Black, Rachel! Dreams and Shadows by C. Robert Cargill..as i read this book i can actually picture what was going on!!! This book was so hyped up during BEA, I'm so glad you liked it! It seems like Black really gets in the nitty-gritty about vampires, dark and scary ones at that! I can't wait to see how she develops Coldtown. I'm so glad to see that the romance was perfect! Beautiful review, Rachel, and awesome picture with Holly! Splintered is definitely my favorite creepy read. I LOVE this book! I didn't know that this book was so creepy! Now I wanna read it ASAP! I'm excited! I really liked The Historian! It's an adult vamp novel and it was hella creepy! It's been a while since I read the books, but Simon Holt's THE DEVOURING trilogy is super duper creepy. Thanks for the giveaway--I really, really want to read this book! This is Not a Test by Courtney Summers.love me some zombies! Favorite creepy books are Bad Girls Don't Die by Katie Alender and Anna Dressed In Blood by Kendare Blake, absolutely love creepy books! Thanks for the giveaway! My favorite creepy read is the Unbecoming of Mara Dyer by Michelle Hodkin, though I think the sequel was a bit creepier. :D Thanks for the great giveaway! Ooh, I didn't realize it was in the horror zone, but I like it even more now. Usually I'm not a fan of creepy or gory books, but I love vampires and I've heard great things about Holly Black, so I'm definitely going to read this one. I'm so glad you loved it, Rachel! Great review! I'm reading Stephen King's Joyland right now and it's pretty creepy! The creepiest ever is IT. I hate clowns! Anything by Stephen King. Also reading In the Shadow of Blackbirds now and it is pretty creepy! Thanks! This sounds soooo amazing. I love creepy reads, and the fact that this one is by Holy Black just makes it so much more appealing :) Perfect romances are hard to find as well. What's my favorite creepy read? I'd have to say Anna Dressed In Blood & Girl of Nightmares by Kendare Blake. I could go back to those two books whenever I want for a good read. I Hunt Killers & Game. I didn't think I was up for yet another vampire story, but when Holly Black writes it its a whole different thing. I have the e-arc and I've been trying so hard to resist it, but I guess I should stop now. I am SO in the mood for something deliciously creepy. Oooh, I seriously wanna read this now! LOVE Holly Black- and her awesome hair! :) My favorite creepy read was Bad Girls Don't Die- talk about creepy! I've read Black's Tithe series, and really enjoyed it. This sounds like another fabulous story. Thanks for the great review, Rachel! I love the Unbecoming of Mara Dyer. Okay, your comparison to McKinley's Sunshine has definitely intrigued me! 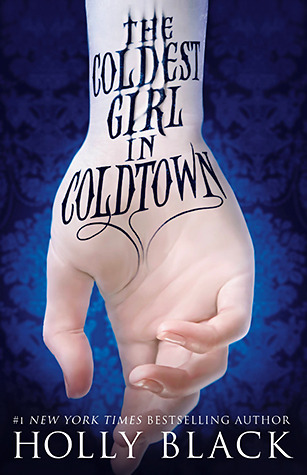 I definitely consider that to be of a higher-caliber vampire story, so I'm interested as to how The Coldest Girl in Coldtown can compare to it. I had a really good experience reading my one Holly Black novel so far (Tithe) and need to read more of her works soon. Lovely review, Rachel! I have this one for review and I am beyond excited. This will be my first Black novel and I have super high hopes for it. Love how you describe the mixture of gore and humour! 666: The Number of the Beast. Some stories gave me the serious creeps! I LOVED Anna Dressed in Blood! Thanks for the AWESOME Giveaway! :-) Good Luck to everyone! Comment name and Rafflecopter name is different. I'm currently reading Battle Royale, and I like it a lot. It's extremely creepy, and gory! Lots of horror makes me very nervous! BUT I love books that do this: "Holly Black does not hold back painting beautiful and yet terrifying tale." I also absolutely love a subtle romance within a story, especially when there's moral ambiguity attached to it. I've read a lot of mixed things about this book, but I'm really hoping that I love it, and it means a lot that you enjoyed this one! Love the paragraph about subtle romance! Couldn't have said it better! Love it! Pretty Dark Nothing by Heather L. Reid I found to be quite creepy. It wasn't the best book by any means but there was tension throughout the whole book that always kept me wary and on edge. The Mara Dyer series. Totally creepy and bizarre. Thanks for the giveaway! Thank you for this amazingly awesome giveaway!